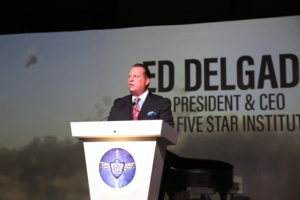 The Five Star Conference’s annual Keys for Life reception on Monday saw Five Star’s Lifetime Achievement award bestowed upon two recipients: the late Robert Klein of Safeguard Properties who was posthumously recognized for his contributions to the industry and Caliber Home Loans’ Marion McDougall. An industry veteran with more than 25 years of financial services experience in the U.S. and internationally, McDougall has worked in mortgage and retail banking with a particular emphasis on mortgage servicing, business development, and post-closing. She currently serves as EVP, Chief Loan Administration Officer for Caliber Home Loans. Robert Klein (1953-2018), founded Safeguard Properties in 1990 and built it into the largest national mortgage field services company in the U.S. After stepping down as CEO in 2010, Klein's ingenuity continued with the creation of Community Blight Solutions, a company focused on eliminating urban blight. Klein was also Founder and Chairman of SecureView and RIK Enterprises. The Keys for Life event was capped by the annual tradition that gives it its name: the presentation of mortgage-free homes to five United States military veterans and their families, courtesy of JPMorgan Chase, Auction.com, and Operation Homefront. Acknowledging the commitment of the sponsors to this initiative, Ed Delgado, President, and CEO of the Five Star Institute said that JPMorgan Chase would be gifting their 1,000th mortgage-free home to a veteran in November, and that gift was facilitated by Operation Homefront. 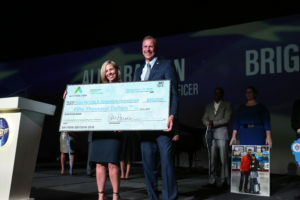 Recognizing Operation Homefront’s initiatives to help veterans and their families transition successfully to their local communities, Ali Haralson, Chief Business Development Officer, Auction.com presented a check of $50,000 to the organization. This is the seventh check of this denomination that Operation Homefront has received from the real estate auction company. This year’s Military Hero Home Recipients included Army Specialist Ricky Dibble, from Grand Blanc, Michigan; Marine Staff Sergeant Oscar Gutierrez, from Darrien, Illinois; Army Specialist Hicham Ouafi, from Middletown, New York; Army Sergeant Edward Poe, from Smithfield, North Carolina; and Army Sergeant Tamarra Stewart, Belcamp, Maryland. The evening ended with a soulful concert by American singer, songwriter, actress and author, LeAnn Rimes, but before that the audience bid with gusto for five guitars signed by the artiste, the proceeds of which will go to Operation Homefront’s initiatives for veterans.